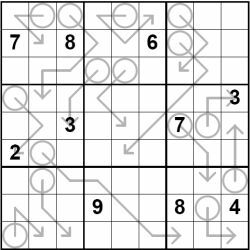 Arrow Sudoku is a variation on sudoku, which you may also know as Sudokuarrow. But if you've never come across this fascinating puzzle before, then take a look at the grid to the right to see a sample puzzle - it will also reveal exactly why this puzzle has the name that it does! In arrow sudoku, the aim is to place the numbers from 1 - 9 once each in a row, column and 3x3 box. But you will notice that there are two differences: firstly there are many fewer given starting numbers than in an ordinary sudoku, and secondly of course there are arrows. The two are related. The arrows indicate certain regions of the puzzle in which the numbers are of significance. Specifically, the cell that is circled is the sum total of the other cells along the path of the arrow. Therefore if the three cells along the path of an arrow should contain 1,2,3 then the circled cell contains 1+2+3=6. Repetition of a number is allowed within an arrow, as long as that repetition does not fall foul of the ordinary sudoku constraints. For instance, if two numbers along the path of an arrow are in the same row or column, then they cannot contain the same number as ordinary sudoku rules disallow this. However, cells that are in different regions of the puzzle can contain the same value, so for instance an arrow that crosses several regions could perhaps contain 1,2,3,1 for instance. Because of the arrow regions in the puzzle, you will need more than just sudoku logic to solve arrow sudoku. You must also look at the possible values within the arrow: both for the total cell (circled) and the cells along the path of the arrow. It is this combination of sudoku logic with the interesting and sometimes subtle deductions that can be made from the arrow regions that make this such a compelling and interesting puzzle. All arrow sudoku have one solution that can be reached through logic alone: no guessing is required. Interested in giving your readers a new and fun sudoku variation? Then try arrow sudoku! Please do contact us with your requirements. Publishers - Please contact us to buy Arrow Sudoku puzzles for publication in your book, magazine, newspaper, any other printed media or online.